Pre-Travel authorisation enables governments to improve border security while simplifying the border control process for passengers, airports and airlines. International air transport has continued to show strong growth through 2016, with traffic up by 6.4 per cent over the first seven months of the year, including a 15 per cent increase in the Middle East and 9 per cent in both Africa and Asia Pacific (Iata figures). This increase in traveller numbers places strain on a broad range of systems and services, not least border control – which in many countries is exacerbated by heightened concerns over security and immigration. A growing number of countries are finding that pre-travel authorisation is the key to avoiding long wait lines at the borders and to more efficient management of border control resources. Crucially, it ensures that those who do not match entry criteria are not permitted to travel to their destination in the first place. At the heart of pre-travel authorisation is a mix of technology, systems integration, network connectivity and processes shared between border management agencies and key stakeholders such as airports and airlines. Of course, pre-travel authorisation is not new. Visas began to be introduced from the 1920s, however, many governments still require only a minority of foreign visitors to obtain a visa in advance of travel and little is known of those not requiring a visa until they arrive at the port of entry. This has necessitated conducting checks upon arrival, often causing lengthy delays – and leading to additional costs for detention, processing and repatriation when arriving travellers are deemed inadmissible. In addition, many border agencies already receive some passenger data from airlines, but it is often incomplete or inaccurate – and may only be available after an inbound flight is already in the air. Pre-travel authorisation plugs this gap by providing high-quality data for governments to validate before passengers even board their inbound flight, allowing travellers to be prevented from traveling if they would be deemed inadmissible upon arrival. Security is improved and the reduced workload from not handing inadmissible passengers at the border frees up resources to ensure that arriving passengers are able to progress smoothly through border controls. Pre-travel authorisation is a way of collecting and distributing information that allows border agencies to assess travellers’ risk level before they travel. It also opens up the way for further automation of border control for low risk travellers. For example, the use of Electronic Travel Authorization (ETA) allows governments to vet travellers before travel, such as by checking watch lists and databases to see if there is any reason not to admit the applicant. When the traveller is cleared for travel, they will be registered on the government’s database. Sita’s Advance Passenger Processing, or APP, solution integrates pre-travel authorisation with airlines’ check-in processes for real-time clearance by the authorities of the destination country and, in some cases, those of the departure country as well. Using APP allows governments to receive each passenger’s travel document and flight details at the time of check-in, regardless of whether the check-in is online, using a kiosk or in person. The government vets the traveller and then returns an ok-to-board or no-board instruction to the check-in agent or, if check-in is online or via a kiosk, to the check-in application, which then instructs the traveller to speak to an airline agent. In partnership with Sita, the Australian Department of Immigration and Border Protection (DIBP) pioneered pre-travel authorisation with the introduction of the Electronic Travel Authority System (ETAS) in 1996. ETAS enabled Australia to cope with a huge influx of visitors to the Sydney Olympic Games in 2000, without compromising border security. Today Australia processes over 2.5 million ETAS transactions a year using iBorders and 3.5 million ETAS queries. The Australia Government has also made Advance Passenger Processing (APP) mandatory in Australia. 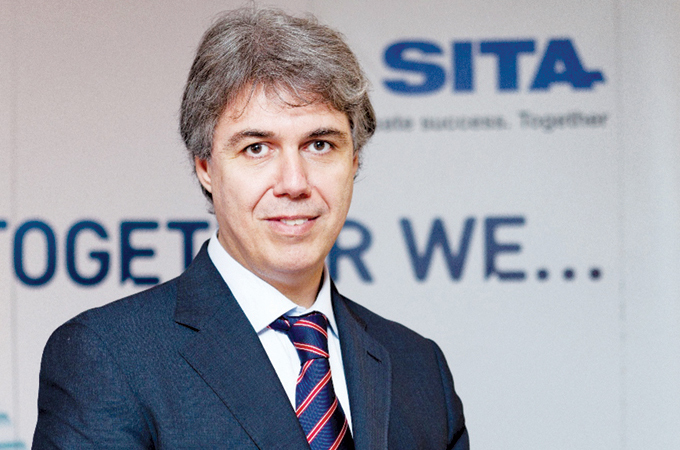 Sita has also helped across the Middle East, at the crossroads between East and West and a strategic area for air travel, trade, tourism, business and investment. But it’s also a target for terrorism, so while countries around the world have implemented border management systems of limited scope – often in a piecemeal fashion – Sita has helped many governments in the Middle East deploy fully integrated border management systems, allowing them to become world leaders in air transport security and facilitation. The movement of people across the world has never been greater, but the result has been the need for increased security and border management. Fortunately, technology is delivering the means to minimise the inconvenience to passengers, airlines and airports – while maximising the ability of governments to fulfil their primary obligation to their citizens.